When I use Dock Panels, I have question. My target: I want use noperisten object's detailView as Master to filter one persistent objects' listView. I have peristent object: 'DemoTask' and noperistent object 'DemoTaskFilter'. 'DemoTask' have two properties: subject and StartDate. 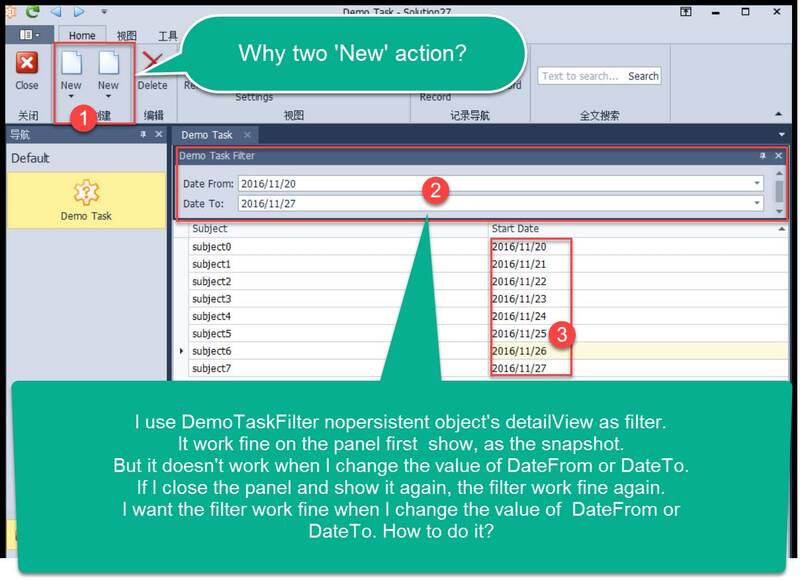 'DemoTaskFilter' have two properties: DateFrom and DateTo. I use 'DemoTaskFilter's detailView as Master. I want it can filter the DemoTask listView' CollectionSource when I change the 'DemoTaskFilter' DateFrom and DateTo. When the 'DemoTaskFilter' DockPanel show at first, the filter work fine. But when I change the value of DateFrom or DateTo, the filter doesn't work. If I close the filter,and open it again, it work fine. By the way, I find the application have two 'New' action when the 'DemoTask' listView show. Why? How to slove it? To solve a issue with doubles actions for TypeUI = TabbedMDI you can see the ticket: Adding Dockpanels doubles Standard actions. The relation of DockPanels like 'Master with parameters' works with a custom action. You can see additional information in our Demo Center (Start -> Xafari Framework v... -> Demo Center -> DockPanels: Department and DockPanel Filter_V2) and controller Xafari.DemoDockPanels.Module.Controllers.FilterWithoutOSBaseObjectViewController, i.e. you must create controller for action Apply or handle actions a select DateFrom and a select DateTo. Also you can use Xafari Filter for the situation described by you. We hope you find this information helpful. If you need any further assistance on this subject, please feel free to contact us. Your answer is very good! My Soloution work fine now!